Marketing seems to be such a dirty word today. But even worse, I don’t understand why bands don’t care about marketing and to use the old saying, it is a necessary evil. So many bands complain about how ‘making it’ in the music industry is not about your talent, it is about who you know. It is sad to have such a close minded attitude, to think such a large industry could be controlled by a simple few. It is in essence, quite a defeatist attitude and for those of you who have the ability to wipe this mindset to the side, are typically the ones who will succeed. I wrote an article a few days back about why bands fail to succeed and one of my key points was the inability to move past this, to actually make this mindset work towards your favour. Create a list of influencers and begin networking with these people who you believe can aid in the success of your band. But let’s be honest, being ‘in’ with the influencers is not the golden ticket to success, the main group of people that matter are the punters and getting them to discover your band. The old marketing term, awareness, is what trumps all things. People need to actually know who you are, yet hardly any musicians out there, especially in the genre of music I am involved with, really think about it. Yes the influencers may be the gate keepers in helping spread the word, but it’s 2014 people. There are so many ways to connect with potential fans, it is not even funny. Yes there are the free methods out there, like Facebook and Youtube, but platforms such as these can be used to boost your awareness to a new level. I find it amazing still today, that a band will be happy to drop $30k on recording an album, yet they spend little or nothing on promotion and marketing. It’s kind of mind boggling. Creating the most awesome album out there that is so f$%kin awesome and think it will create a wave of new fans, is just stupid. Sorry to tell you, it just doesn’t work that way. But back to my point on why I know that bands don’t care about marketing. 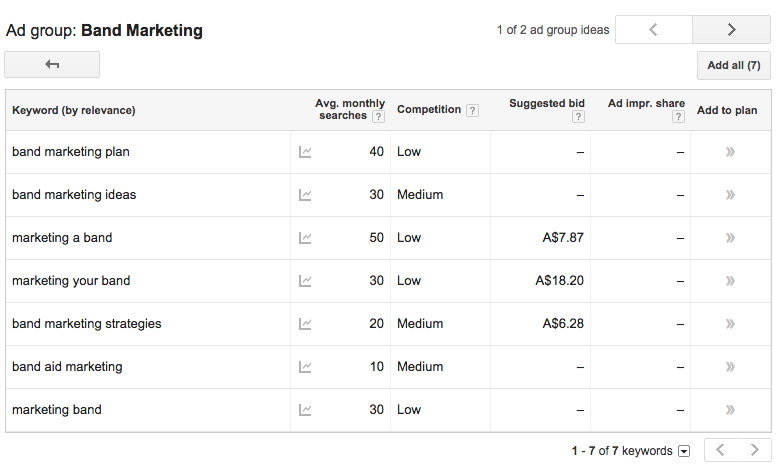 It is simple to find this out, if you are aware of online marketing you are probably aware of Google Keyword Planner. If you are not, quite simply it is a tool which you can use to search for what people are searching for and how many searches a month that specific phrase gets. In my simple experiment I used the terms band + marketing and these were my results for worldwidesearches. Take into consideration how many bands are out there. I was absolutely shocked to be honest. So as you can see in the image above, a whole 210 searches a month worldwide with the terms band and marketing included in them. 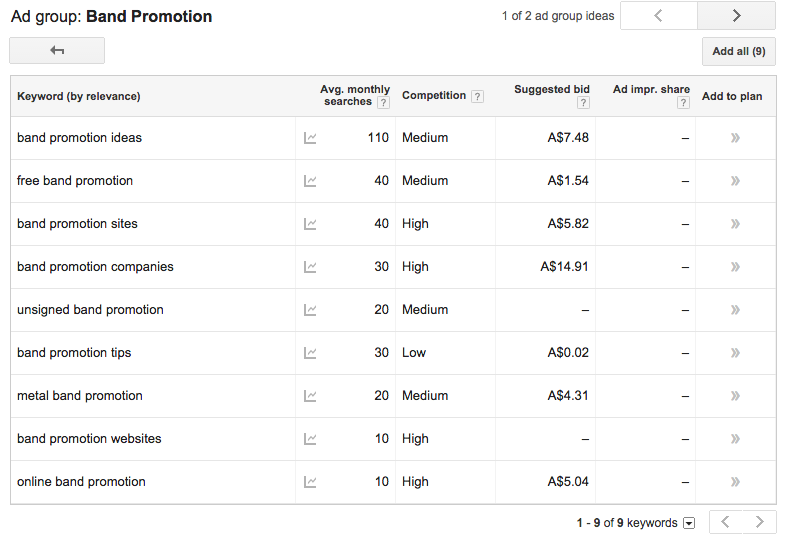 The next snap shot of searches is band + promotion. This instance it bumps up to a whole 310 searches per month. Again remembering that this is world wide. So why am I writing this? Well simply I just want you to think a little. Think about your band and what you want to achieve, if you want to make your band a viable and sustainable venture, you’re probably going to have to do things a little different to others. You’re happy to spend money on gear, you’re happy to spend money on production, so why are you not thinking about spending money on gaining a bigger awareness for your band? It’s time to change your mindset people and start changing your priorities about where you invest money and time into your band. For those of you who don’t know where to start, I’ll be doing some posts on some internet marketing strategies that can benefit your band in the coming weeks, subscribe in the right column area to make sure you do not miss out on any these. Until then, just think about it and say what can we do different?